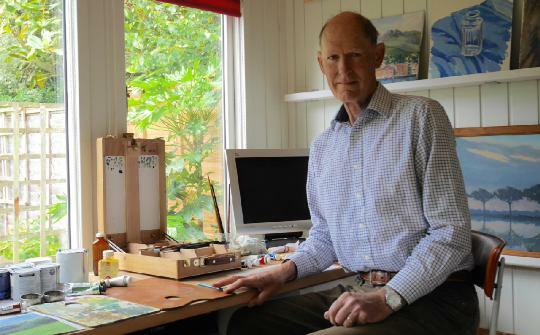 Peter has been painting intermittently for many years but recently, through retirement from his profession, has increased his output of work. He trained at Brighton College of Art and left with a degree in architecture in 1970 and has been practicing as a chartered architect for more than 40 years. Peter works mainly in oils and paints from nature. He has been influenced by Impressionism in the way nature was recorded and is inspired by colour and the interpretation of light, shade and texture. He divides his time between his studio near Beaconsfield and Cornwall, where the quality of light and intensity of colour in the surroundings is exceptional. Peter believes that framing is an integral part of the creative process and frames all his own work in his studio, where some of his pictures can be viewed.